I've said many times before that Disneyland Paris' Fantasyland is truly a fairy tale come to life. Of course, given that France has actual chateaus of its own, and Europe is where fairy tales come from, the Imagineers knew that they would have to design something that transcended the already rich architecture and charm of actual European villages and manifest something that truly felt out of the imagination. And they have, with whimsical structures and creative landscaping. This shot of the Mad Hatter's Tea Cups is but one of many examples. Everything comes together so well, and with sunshine and dramatic clouds in the same shot, it really cinches a memory of beauty and magic! 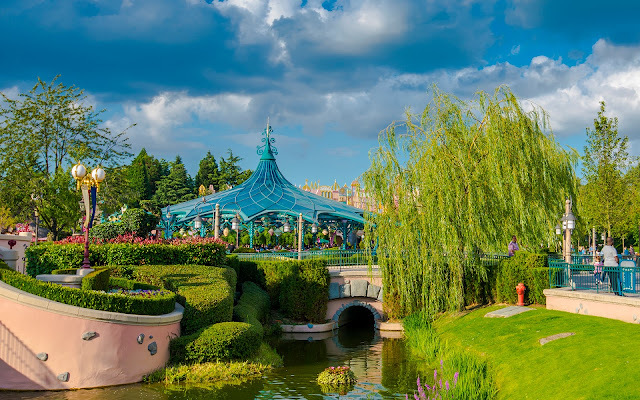 Looking across green lawn and water toward the Mad Hatter's Tea Cups at Disneyland Paris.